Until recently, I have feared making rice paper rolls like I fear rolling sushi (still haven’t got the hang of that). However, one day I decided to give it another go and it didn’t go as horrendously as I had expected it to. This does not mean I am suddenly a rice paper rolling champion but I can now roll it up without everything exploding out of the roll. So, once you get the hang of the rolling technique, rice paper rolls are one of the easiest, quickest and healthy meals you can make. You can stuff anything you have leftover in the fridge into them and they are bound to be tasty. They are easy to transport so they make the perfect work lunch! It seems so odd to think that these fresh rice paper rolls can easily be deep fried and made into spring rolls….maybe that’s something to try at a later date. I have decided to go for a Cambodian/Thai style filling as I was inspired by my parent’s holiday stories about the delicious flavours the Cambodian food had. However, I frequently make tempeh and tofu rice paper rolls and they are also delicious, so feel free to substitute that for the prawns. Heat an oiled pan on high heat and cook the prawns in the turmeric. The prawns will turn a pink shade when they are done. Place in a bowl for later. Cook the rice noodles according to the package’s instructions. Add the zest and juice of the lime to a bowl along with the chilli and coriander. Roughly chop the prawns and the rice noodles and add to the bowl. Fill a large bowl with warm water and dip your first rice paper sheet in. It will take about 5 seconds until it is soft enough. 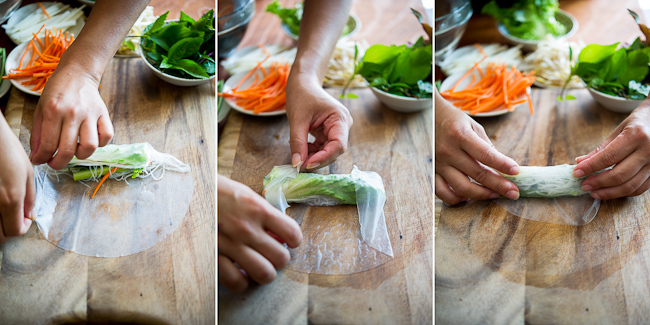 Place the rice paper on a board and fill it with a piece of lettuce and 2 spoonfuls of the rice and prawn mixture. Fold the rice paper over the filling (to the right) and then fold the bottom and the top over it. Continue to fold to the right making sure the filling is neatly tucked in. Here is an illustrated example if you are still confused. Place on a plate and continue making rolls until the mixture is gone. Make sure that the rolls do not touch on the plate or they will stick to each other and break. Pop the rice paper rolls in the fridge to settle for 30mins. Now to make the dipping sauce. Combine all the sauce ingredients in a bowl and whisk until smooth-ish. If the sauce is too thick for your liking then add hot water to thin. The rice paper rolls stay fresh for a couple of days in the fridge and the peanut sauce lasts about a week.